In need of legal help? Our doors are always open. When you work with us. You are represented by Glendale's best. 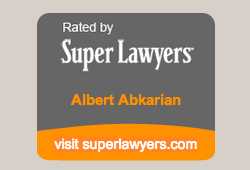 Our law firm is the 2009 winner of Los Angeles Magazine's Super Lawyer Award. We specialize in wrongful death cases, as well as vehicular accidents and personal injury cases. Our associates have extensive knowledge and experience in areas including real estate and arbitration law and business law. We are a specialist law firm that offers great focus on business, real estate, worker's compensation, employment, and personal injury cases. We will give you professional advice on your specific case and effectively represent you in court trials and arbitrations. We focused areas of practice, including international law, business law, real estate transactions, personal injury and worker's compensation, and arbitrator mediator discovery referee. Here, you get the special attention that your case deserves as we ensure personalized service on each of the cases we handle. No other law firm will give you the amount of attention and personal service that we can. We serve Los Angeles, CA, but we also cover the greater areas of Pasadena,Glendale, and Burbank. Feel free to contact us for legal advice and other issues regarding the law.